Air Force One is the air traffic call sign (name) of any U.S. Air Force aircraft carrying the President of the United States. The president usually flies in one of the two specially changed Boeing 747 jumbo jets (airplane) kept by the United States Air Force. 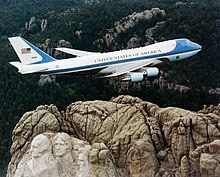 They are only called Air Force One when the President is on board. If the Vice President or another senior official is flying it is called Air Force Two. Otherwise it is called by its number like any other airplane. When Richard Nixon resigned as President in 1974 he flew back to his home in California in Air Force One, but halfway to California he stopped being President and the airplane was then given a new name. This page was last changed on 4 September 2018, at 22:33.